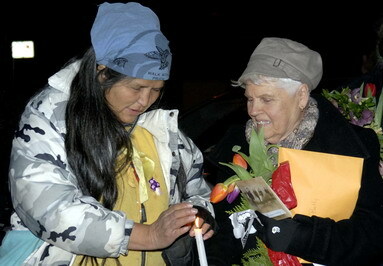 Harriet Nahanee Vigil, 23 February 2007. Harriet Nahanee Petition: We, the undersigned, condemn BC Supreme Court Justice Brenda Brown's handling of contempt of court charges against 71 year old native Elder Harriet Nahanee which resulted in a 14 day jail sentence on January 24, 2007. Respected Elder Nahanee filed an appeal, but she passed away shortly after being released from Surrey Pre Trial Services Centre. "The public now demands that BC Attorney General Wally Oppal and BC Premier Gordon Campbell launch an immediate public inquiry into the Supreme Court of BC's treatment of Respected Elder Harriet Nahanee." 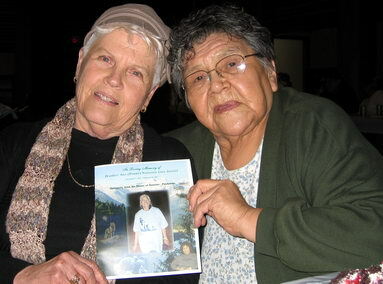 Harriet Nahanee and Betty Krawczyk were arrested by the Vancouver police on 25 May 2006. In a fortuitous coming together of two formidable women, one a principled First Nations fighter for Indian traditions and land rights, the other a non native long time champion of forest preservation, a courageous halt was called to the greedy corporate encroachment on Eagleridge Bluffs. As a result of their stand, the two women were forcibly removed by the police and taken into custody. Both women strongly objected to the destroying of a wetlands for highway expansion, to the illegal land grab of Squamish Territory, and to the use of injunctions to punish protesters. 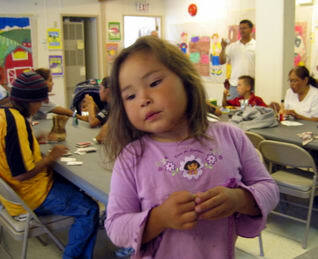 Court ordered injunctions especially victimize First Nations. Harriet Nahanee (nee Jones) was a Pacheedaht from the "Chief Over All Chiefs" Queesto family (right) and a holder of traditional knowledge. Despite her hereditary status, age and frail health, on 24 January 2007 she was sentenced to 14 days in the Surrey Pretrial Centre - a notorious hell hole. During her incarceration she contracted pneumonia and following her release, she was admitted to St. Paul's Hospital in Vancouver. Betty Krawczyk wrote a letter to the court judge prior to the sentencing of the Pacheedaht elder urging compassion: "I am very worried about Mrs. Harriet Nahanee. Mrs. Nahanee is not well. She has asthma and is suffering the after effects of a recent bout of flu that has left her very weak" Letter by Betty Krawcyzk. 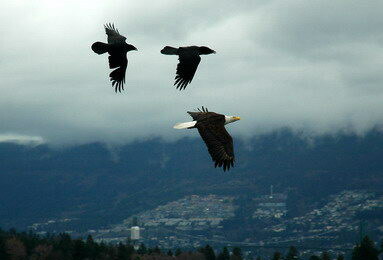 Eagle and Two Ravens, Vancouver, BC. "Because she refused to say 'I'm sorry' to Madam 'Justice' Brown ... because she refused to apologize for her part in the protest she was jailed and now her health is deteriorating in hospital ... she is hard of hearing and this caused problems with the judge and now also in the hospital. Her hearing loss was as a result of abusive treatment in residential school as a child." 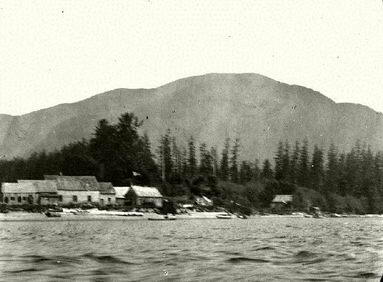 "Pacheena Reserve at Port Renfrew," 6 May 1914. As a five year old aboriginal child who spoke only her native language, in 1940 Harriet Nahanee was abducted from her family and home on the remote Pacheena Reserve and taken far away by RCMP gunboat to residential school to be assimilated. Pacheena Indian Reserve No. 1 (left) was visited by the Royal Commission on Indian Affairs on 6 May 1914. The Pacheedaht spoke up clearly against the unjust colonial land grab. See: McKenna McBride Report (1916). During the next half century, Pacheedaht Territory was ruthlessly clearcut logged, mined and overfished, leaving behind a wasteland. This destruction was witnessed by Harriet Nahanee, who says of settler society: "Their idea was to civilize us and make us Christians, actually it was a process to take us away from the land" SISIS (July 1995). 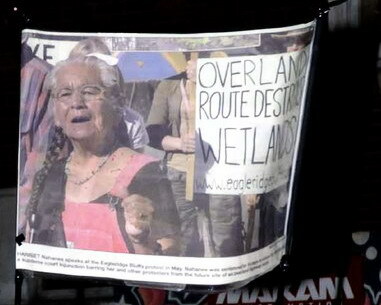 Following her arrest, Harriet Nahanee again defied the injunction and on 4 June 2006 returned to Eagleridge Bluffs to bless the "red footed frogs," as she calls them. Betty Krawcyzk explains: "When I asked her why especially the frogs she said that red footed frogs only live in wetlands and they signify life because that is where we all came from - the wetlands - and so the red footed frogs also signify life to humans, and that in the Pacheedacht belief when the last red footed frog dies all of humanity will also die." Harriet Nahanee's weak physical condition did not deter her from carrying out her hereditary Pacheedaht obligation to say prayers and sing a death song for the creatures who will not survive the highway expansion at Eagleridge Bluffs. 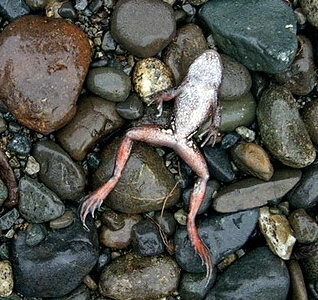 The red legged frogs (right) and other native wildlife, salmon and plant species that inhabit BC's wetlands and riparian zones are increasingly facing extinction. The failure to protect these vunerable species epitomizes the government sanctioned corporate abuse of both nature and indigenous land rights. Red legged frog, Somass River, Vancouver Island. On 23 February 2007 a rally for Harriet Nahanee began at the BC Supreme Court in downtown Vancouver and continued on a ceremonial walk to and around St. Paul's Hospital. A prayer vigil with drumming was held outside Harriet's hospital room and the "Women's Warrior Song" was performed to give Harriet support and strength (right). Earlier, Betty Krawczyk had accompanied Harriet for a CAT scan in the hospital and although greatly weakened, Harriet insisted that the battle to save the wetlands continue. 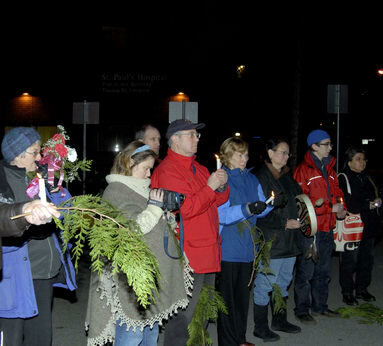 First Nations activist Rose Henry (Snuneymuxw, Coast Salish) and the non aboriginal forest activist Betty Krawczyk took part in the prayer vigil for Harriet outside the hospital (left). "By participating in this vigil you are declaring your outpouring of support for Harriet Nahanee and her right to fight to protect our land and environment, and for her rights as an Indigenous person. We urge people to see this action as taking a stand against an unjust system" Indigenous Action Movement. Harriet Nahanee, Eagleridge Bluffs, 23 May 2006. Tragically, Harriet Nahanee passed away on 24 February 2007. "It is with enormous sadness that we experience this loss of one of our knowledge holders, grandmothers, original speakers and women leaders. It is outrageous that a 71 year old Aboriginal woman was arrested and put in jail - she was protecting our land, our animals, our air, and our capacity to survive ... One of our important Elders and leaders has needlessly been killed - a 71 year old woman who had the strength to protect and to not apologize for protecting what she understands is necessary for sustaining all life and it is Aboriginal Land that was being protected" 25 February 2007, Gloria Mulcahy, film maker & professor, Western Ontario University. "Our Dear Elder and Friend Harriet Nahanee. They arrested her for standing up for her rights to the lands at Eagleridge Bluffs; she wanted to protect this land not for herself but for all generations to come. They criminalized her, imprisoned her and as a result of the conditions of the jails, being cold and unhealthy, her personal dignity torn by the acts of one judge, she became ill" 26 February 2007, Rosalin Sam, Sutikahl spokesperson. Casket of Harriet Nahanee, 28 February 2007. 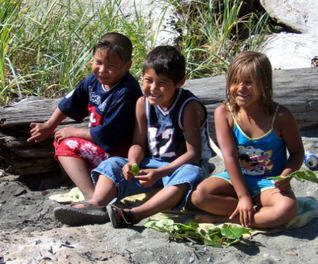 Services for Harriet Nahanee were held on 28 February 2007 at the Squamish Nation Recreation Centre. 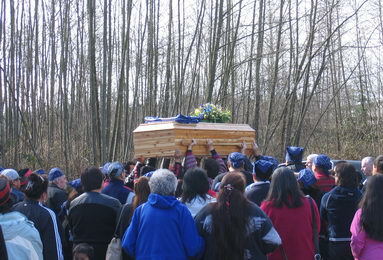 Afterwards Harriet's casket was carried outside, with her family regalia on top, to begin her last journey home to the Pacheena Reserve on Vancouver Island (above). Family members wore blue bandannas to mark the solemn occasion. Harriet leaves behind her husband of 25 years Ron Perry (right) and four sons from her earlier marriage to Squamish Nation member Harold Nahanee as well as many grandchildren. Of her seven children, one infant son predeceased Harriet as well as two grown daughters under tragic circumstances. Ron Perry, husband of Harriet Nahanee. Harriet Nahanee memorial service, 28 February 2007. The service for Harriet Nahanee was attended by hundreds of people including Betty Krawczyk and Irene Billy (above), the intrepid Secwepemc activist. They are holding a tribute to their friend: "In Loving Memory: Harriet Ada (Perry) Nahanee (nee Jones), 7 December 1935 - 24 February 2007. Thitspa7s, from the House of Queesto-Pacheeda." 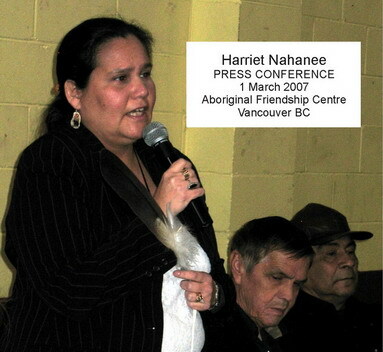 The following day, on 1 March 2007, a press conference was held at the Aboriginal Friendship Centre in Vancouver to address the circumstances of Harriet's untimely death (right). Press conference, 1 March 2007. Beverley Jacobs speaking, 1 March 2007. 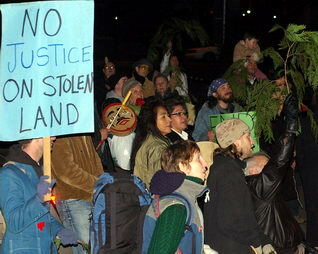 On Vancouver Island, a 2 March 2007 rally to protest against the desecration of SPAET cave was dedicated to Harriet Nahanee by Lekwungen activist Cheryl Bryce. "Harriet was a true Warrior and a true Elder. We are honouring her for all she has done and to keep the spirit of her work going. She had tremedous courage and perseverance" Protest Rally. 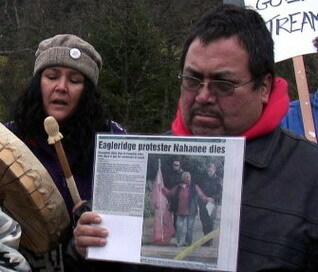 Tsartlip Chief Chris Tom took part in the rally: in the photo (right), he is holding a newspaper tribute. SPAET is part of Tsartlip Territory and it is being encroached on by Bear Mountain Resort, yet another development scheme whereby huge properties are grabbed in shady big business - government deals made before the Aboriginal Title of the land has been resolved. See subchapter: SPAET. Many moving eulogies were wrritten for Harriet Nahanee but one underlying question was asked by everyone: "Why did BC sentence an Aboriginal Elder to death?" Speaking up at the press conference was Beverley Jacobs, president of the Native Women's Association (left). Sitting beside her are Squamish Chief Capilano and Lil'wat Elder John Williams from Mount Currie. A public statement was made by the Indigenous Action Movement: "Fellow Aboriginal activists and concerned non-indigenous citizens demand answers regarding the death of Harriet Nahanee as a direct result of her incarceration" 1 March 2007, Press Release. Eagleridge Bluffs protesters spoke in praise of Harriet's vision and courage and also demanded an enquiry: Testimonials. Harriet honoured, Victoria, 2 March 2007. Harriet Nahanee banner, 23 February 2007. Harriet Nahanee fought not only for Indian rights and for protecting the environment but also against the widespread discrimination and mistreatment of indigenous people, especially of women. When the BC court magistrate sentenced the Pacheenaht warrior to jail because she had "demonstrated no remorse and did not apologize for her conduct," the shameful conceit of the legal systems of BC and Canada was crudely exposed. 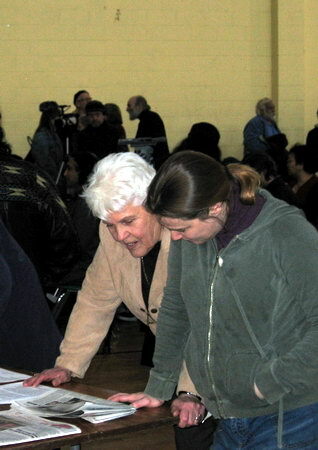 On 5 March 2007, the same magistrate sentenced 78 year old Betty Krawczyk to 10 months in prison for standing in solidarity with Harriet in blocking corporate encroachment on Eagleridge Bluffs. The supporters of Betty and Harriet issued a press release on the unjust use of civil injunctions in BC: Condemnation of the Supreme Court. Also fighting an injunction in BC Court in 2007 is Tahltan elder Lillian Moyer, arrested for her defense of the sacred headwaters. See subchapter: Klabona. Harriet Nahanee was filmed in 2005 by Gloria A. Mulcahy as part of a documentary project in Vancouver BC "dedicated to the survival of our Original Peoples and to strengthening the heart beat of our many Nations" Vision Quest 2005. To see a video clip of Harriet Nahanee speaking on the Vision Quest 2005 film, click the photo on the left (QuickTime, 13 MB). 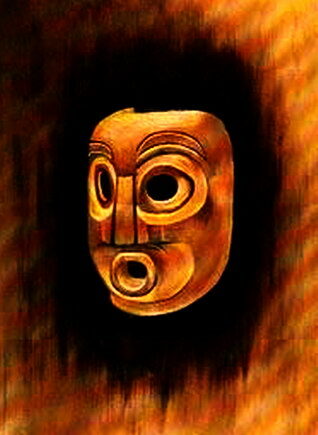 To read a poem, click: Tsibeotl/stardust going home. About the death of Harriet Nahanee, Professor Mulcahy says: "It is important at an international level and in our places where 'knowledge is honoured' that we take action against such acts of genocide and colonization. The legal system must be decolonized and we must decolonize our minds so that we can save the trees, forests, plants, animals, air, water and Mother Earth from continued destruction" 25 February 2007, Gloria A. Mulcahy, Eulogy for Harriet. The Vancouver Sun newspaper photo of Harriet Nahanee holding the Mohawk Warrior flag in one hand as she is being arrested by two Vancouver police officers on 25 May 2006 at Eagleridge Bluffs has become an iconic image of indigenous rights. Harriet insisted on being called an Indian and she identified with the warrior symbol of native resistance. Along with her ceremonial House of Queesto blanket, the Warrior flag lay on top of her casket. 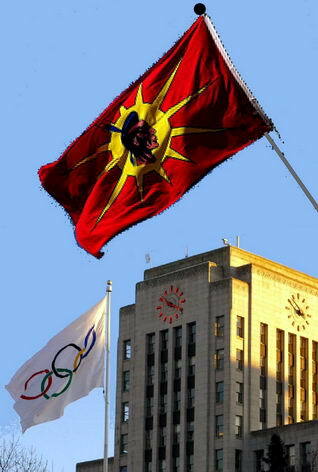 The Native Warrior Society honoured Harriet Nahanee on 6 March 2007 by removing the Olympic flag from the Vancouver City Hall (right). Warrior activists sent a message to the visiting International Olympic Committee (IOC): "We stand in solidarity with all those fighting against the destruction caused by the 2010 Winter Olympic Games. No Olympics on Stolen Native Land!" 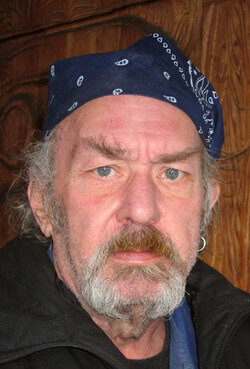 "Harriet Nahanee's death brought back to me the words of the International Olympic Committee (IOC) and the BC government ... because of the opposition of many people to the 2010 Olympics [they] made a statement that they would not tolerate road blockers, or anyone in opposition to the games; that they would criminalize them and jail them at all costs to save the face of the 2010 Olympics" 26 February 2007, Lilwat Rosalin Sam. See subchapter: Sutikalh. The corporate and commercial greed behind the Olympics is epitomized by the brutal treatment of Harriet Nahanee. Rampant resort encroachment on unceded First Nations land is proceeding at a frantic pace at Whistler by development companies like Intrawest and Fortress Investment Group. 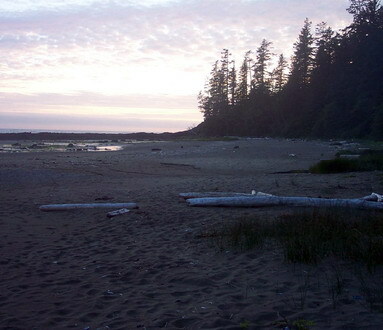 The ashes of Harriet Nahanee were buried by her family on the beach at Pacheena Reserve (left) near Port Renfrew, where she was born and raised. Here the temperate rainforests were home to some of the biggest trees in the world. During her lifetime, Harriet witnessed their annihilation by the logging industry that invaded her homeland in a voracious government condoned land grap. Today the destruction continues as the logging companies sell off their "Tree Farm Licences" to developers. Three Point Properties (owners of the development at Bamberton) and the Bell Group are set to make huge profits by converting Port Renfrew into exclusive real estate subdivisions. Urban sprawl with its destructive infrastructure degrades the priceless biodiversity of the land that Harriet Nahanee fought to protect by asserting her indigenous rights and telling big business and government at Eagleridge Bluffs: "No treaty: no jurisdiction." Pacheedaht elder Arnold Jones, August 2007. 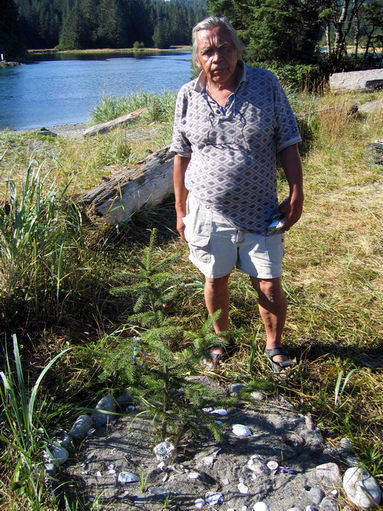 Pacheedaht elder Arnold Jones stands beside the memorial tree planted at the site on the Pacheedaht beach where the ashes of Harriet Nahanee are buried (above).